Buy a 2-Pack and Save 15%! Specially formulated to work immediately to suppress foam caused by soap, shampoo, cleanser and other residuals in your Softub. 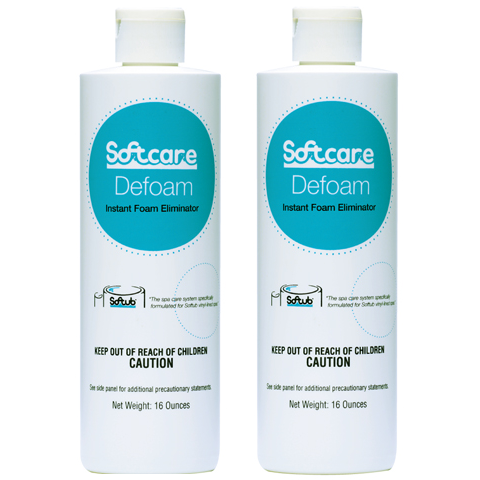 Defoam – Buy a 2-Pack and Save 15%! A specially formulated oil-free silicon which works immediately to suppress foam caused by soap, shampoo, cleanser and other residuals in spas and hot tubs. Pour directly on foam and watch it disappear. The most common cause of foam in a spa when you turn the air on, is not enough chlorine sanitizer. Keep your chlorine in the proper ranges and you will use a lot less of this product. Defoam will not affect water pH. 1 Order = Two 16 Ounce bottles. Shake well and dispense approximately one capful of Defoam onto the surface of the water while the jets are on. Wait 30 minutes and repeat treatment if foam has not subsided. Note: If more than three capfuls of Defoam have been used within a 24 hour period, it is recommended that you clean your filter with Softcare Filter Renu to prevent filter clogs. If Swallowed: Call poison control center or doctor immediately. If conscious, immediately give 2 to 4 glasses of water, and do not induce vomiting unless told to do by poison control. Eye Contact: Hold eye open and rinse gently with cool water for 15-20 minutes. Remove contact lenses, if present, after 5 minutes, then continue rinsing eye. Call poison control center or doctor for treatment advice. Skin Contact: Wash with soap and water. See physician if irritation occurs.